I finished all 3 volumes last weekend. 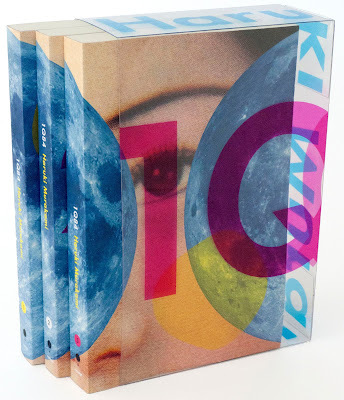 I am still living in the world created in 1Q84. Such is the effect of Murakami's writing. And well, I still visit the world of the wind up bird chronicle, the only other Murakami book I have read. So the books make you climb in their world and make you want to live there. What. An. Achievement. For any writer this is a feat. And for any book lover its a treat. So without getting into any more Murakami praise, I will stick to task at hand i.e. trying to review the book. Book 2 is essentially a love story, of Aomame (uh-oh-mah-me) and Tengo. They are trying to find each other after the intial premise setup in book one. Do they really meet and how entangled their reality is best left to the reading experience. In the process, Murakami takes the concepts/ideas in book one, 'little people' 'air chrysalis' 'other world' to the metaphysical level. Even if interpretations are best left to the imagination, I am really looking forward to discuss these ideas with someone, who has read the book and will not call me insane. Parallel universe is a reality in this book. True to Murakami writing, it has all pop cultural references that even a non-japanese reader can easily relate to. There is a recurring reference to 'The Thomas Crown Affair' and I felt strangely nostalgic. Not just that the peculiar music that keeps on playing in Aomame and Tengo's lives, their music taste, the attention to detail in these descriptions is just mind blowing. If there is one thing that constantly impresses me about Murakami's writing (hey! I am already a fan!) is his this very ability. He compels you to look at day to day objects/things/occurrences with minute and open eyes. Since last weekend I am looking at the moon every night. The moon which has a special significance in Aomame and Tengo's story. In this book, a lot is told about Tengo's personal life, his relationship with his estranged father, his thoughts about his mother. As Tengo is exploring his own life, we journey with him, finding out one detail at a time. Light is thrown on the bestseller book that Fuka-Eri wrote and Tengo ghost-wrote. The sense of mystic around Fuka-Eri and her background continues. The reader gets to journey through Japan as well. I think for all these reasons Murakami is the best Japanese ambassador out there. I will agree with Vivek by questioning the difficulty of reviewing a Murakami book and try to end this futile attempt. With my limited life experiences, I can only say, Murakami's books should be savored by every fiction lover. One should enter his worlds and then look at her surroundings. And then ask in which year they really live. Ok. I do have to read Murakami now . and I mean it.